Estonia (The Republic of Estonia) is a small country situated in Northern Europe. The country covers an area of 45,226 km² and its population compromises of 1.34 million people. The official language is Estonian. The Estonian educational system does not differentiate between primary and lower secondary education. Almost all schools are public. There are three religious schools. 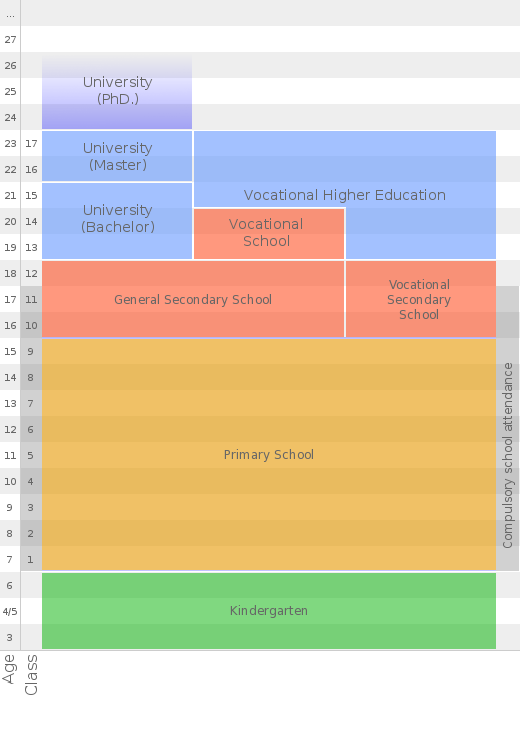 The amount of private schools is quite small. Some private schools are partly funded by the state. In Estonia there are roughly 600 general education schools. Estonian general education school consists of three different levels: primary school, secondary school and gymnasium. There are 80 primary schools, 220 secondary schools and 230 gymnasiums. Schools for children with special needs are also counted among general education schools – there are almost 50 of them. Schools for children with special needs are classified by the differences of needs: physically disabled, mentally disabled and children with behavioural problems. Education becomes compulsory when a pupil turns seven until he or she has reached the age of seventeen or has graduated (usually most of the graduates are 15 or 16 year old). After satisfactory completion of basic education the pupils are obtain the Basic School Leaving Certificate and are to continue their education in gymnasium or vocational education institutions. Home schooling is only legal for a student who has difficulties at school. For these students there are special teachers. Parents can teach their children before going to school (before the age of seven). Compulsory education is free of charge. Funding comes from the local government. Depending on the school and the local government, a student has to buy workbooks and notebooks. A child usually goes to the nearest school from his or her home. The local government must guarantee education for all children. If a school is far from home, the local government must provide a school bus or another way to travel to school from home and back. There are about 500 public kindergartens in Estonia. Local governments guarantee the existence of a kindergarten and a number of free places. There are some private kindergartens, which are funded by children’s parents. Pre-school education is available at kindergartens or other childcare institutions. The role of the childcare institutions is to support and complement the family contribution by promoting the growth, development and individuality of children. Pre-school institutions have become significantly more open, with greater emphasis than previously on the personal contribution, at this level, of family and the home. Several practices have emerged, including family care, the setting up of integration groups, family advice services, and the establishment of private kindergartens and centres for children. The childcare institutions offer some primary education until the age of seven years. There are roughly 80 primary schools (excluding schools for children with special needs). Almost all of these schools are run and funded by the municipalities. Some are private. The grading system used in Estonia consists of a five point scale. 1 is the worst possible grade, 5 the best. The size of school classes is not regulated, depending on the schools and their location class size varies from 6 to 40 students. The country does not oblige children to take any leaving exams during the last year of primary school. No school meals are supplied. Electives in primary school are not common practice. There are roughly 300 schools. 30% of the schools are vocational, the others are gymnasia. Some schools are state schools, some are private. Most schools are funded by the local authorities. The grading system used in Estonia consists of a five point scale. 1 is the worst possible grade, 5 the best. Students can choose their own school. The number of students differs regionally from 10 to 42 per class. An average school day consists of 8-9 lessons. One lesson lasts 45 minutes in most of the schools. Regulations regarding electives are set nationally. Depending on the year the average is about 3 to 4 lessons per week. Counselling is not always available. Access to counselling is lacking especially in vocational schools. For the gymnasia there is a leaving exam. Furthermore, a large majority of students have access to computers. Some schools have uniforms. Extracurricular activities are often organised by a school. In Estonia there are 11 universities (6 public and 5 private). Also there are 20 polytechnics. Scholarships are sometimes granted by universities (not by the government). Some general schools have adjusted their facilities so they can be used by disabled students. In some schools there are special classes for disabled students. In Estonia the “Estonian Strategy of Higher Education 2007-2013” is now being implemented. The strategy of general education schools is not accepted by the parliament. The whole education system is based on the law of education, the National Curriculum accepted by the Ministry of Education, the law of basic schools and gymnasiums, plan of vocational education, plan of general education schools, plan of kindergartens’ curriculum etc. At the moment there’s a discussion on renewing the National Curriculum. 1. Strictly regulated curriculum, where the number of lessons is exactly appointed. The programme is very elaborated and specific. 2. Abandon the National Curriculum and give more freedom to schools, students and parents to shape their own program at schools. Russian general education schools in Estonia are slowly changing into Estonian schools. Society doesn’t focus on the problems in the field of education. Teachers are not valued highly. At schools there are councils, where teachers, students, parents, schools heads and people from local government come together to discuss problems and solve them to make school life better. Work of these councils is changing and becoming more effective.